Joe was born on June 4th, 1924, in Red Oak, Charlotte County, Virginia. After being given up for adoption by his parents he was raised by his half-brother in Randolph, also in Charlotte County, Virginia. Joe’s enlistment record shows he worked as a farmer before he enlisted. He entered the service when he reported for active duty at Camp Lee, Virginia, on May 3rd, 1944. He left the United States for Europe from Boston on July 2nd, 1944. After being in the UK for some time he arrived in France on September 8th, 1944. From there he entered Germany and took part in the heavy fighting in the Hurtgen Forest. The 60th Infantry Regiment was involved in cutting the main Monschau – Duren road, and secure the Road Junction near Raffelsbrand. The German enemy fought back with everything they had. Heavy artillery shelling rained down on the men while advancing inch by inch. During the attacks just south of the town of Germeter, Joe got several chest wounds when he got hit by shrapnel from the German artillery. 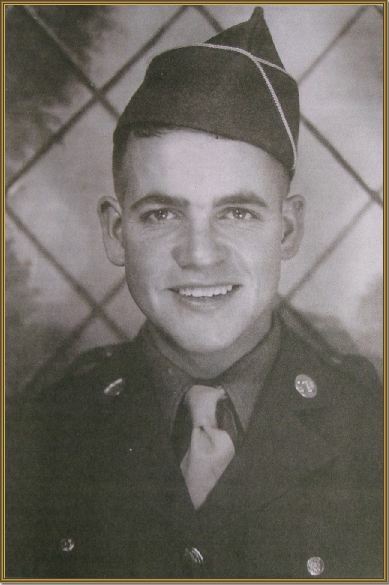 Joe was Killed in Action on October 15th, 1944. Joe was only 20 years old on that day. 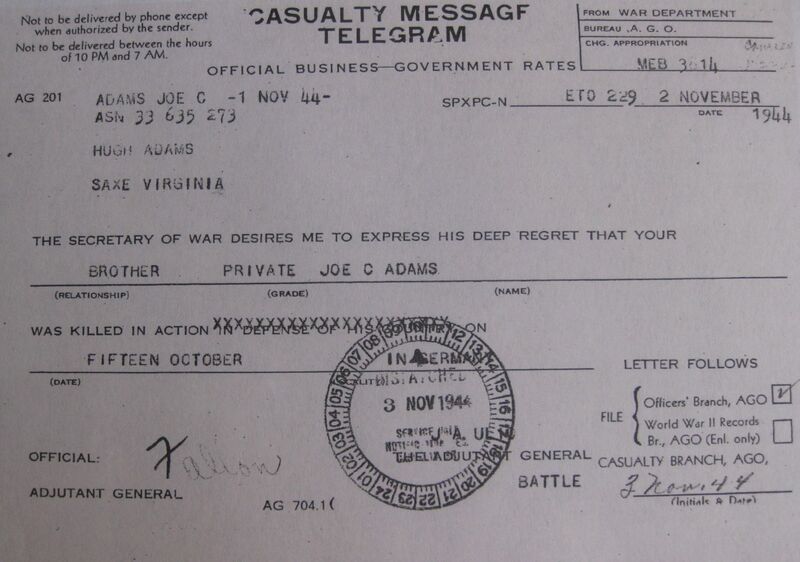 The original Casualty Message Telegram received on November 3rd, 1944 by the family to inform them about the death of their beloved Joe. Private Joe Adams is buried at the Henri Chapelle Cemetery in Belgium, where he rests alongside his brothers in arms.